When Marky’s mother, Heidi, landed at the airport from a business trip to Hong Kong in May 2017, her parents picked her up and drove her directly to the hospital. Her three-year-old son, Marky had been diagnosed with Leukemia and his grandparents had taken him to the hospital. He was very unwell and was placed in the critical care unit. Marky underwent a number of investigations including a bone marrow aspirate and a spinal tap. After several days of treatment, the leukemia cells were not responding to chemotherapy. Additional testing revealed that the leukemia cells had two mutations that designate his leukemia as high risk, with a greater possibility of relapse. His leukemia is known as Philadelphia chromosome positive and it also has a rearrangement called MLL (mixed lineage leukemia). At the time of his diagnosis, Marky was the first child in the world with both of these mutations in his leukemia cells. To battle this form of leukemia Marky was placed on very strong high dose chemotherapy and he felt very unwell. He essentially lived at the hospital from the end of May 2017 until the end of December 2017. In January 2018 his treatment protocol changed to oral chemotherapy that was less intense and he was well enough to spend more time at home. 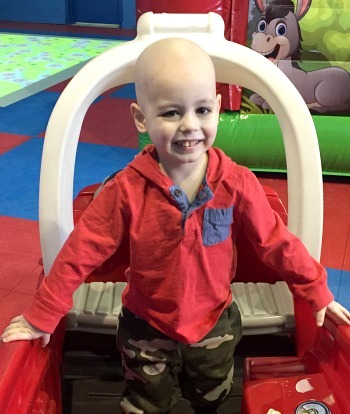 In April 2018 Marky completed the intensification stage of his treatment and moved into the maintenance phase, allowing him and his family to live the semblance of a more normal lifestyle, taking daily oral chemotherapy at home with less frequent visits to the hospital. Much to the family’s disappointment in mid-July doctors delivered the devastating news that he had relapsed. Marky was admitted almost immediately for very intense chemotherapy leading to a bone marrow transplant. After 95 days as an in-patient, including three weeks in strict isolation, Marky went home in October 2018. He remains under the close watch of the cancer and bone marrow transplant specialists at SickKids.